A handy way of tracking the progress of your cosmetic collections. If you're struggling to stay on top of which of the Year of the Rooster items you've managed to unlock so far - and which ones you still need to pray to the Loot Box gods for - then we've found just the thing for you on Reddit this afternoon. 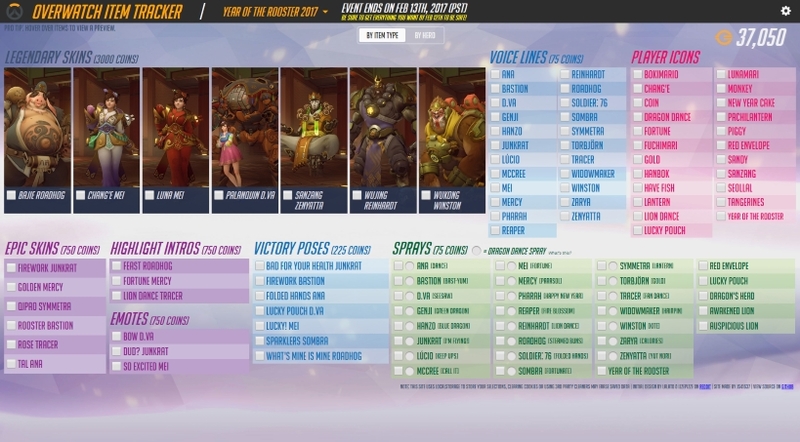 The Overwatch Item Tracker was created by Redditor js41637 (catchy name), and is an interactive chart which contains every single item associated with the event. You can also get a Hero-specific overview by toggling the option located in the centre of the chart towards the top. As well as giving a handy overview of everything that's available, you can also tick off the items you've already looted. When you do so, the cost of that item - in Credits - will be deducted from the event's total in the top right hand corner. As a point of interest, and were you to avoid opening a single Loot Box during the event, you'd need a whopping 37,050 Credits to complete the entire collection. As noted by the creators on the chart itself, if you clear your cookies or clean up your system then you may lose the ticks you've added to the chart, so do keep that in mind. If you want to keep tabs on your progress through other events, simple click the name of the event at the top of the screen.